Jon Francetic didn’t find love with the woman he was matched with on Married At First Sight— but he has found lasting love with one of the women who helped match him! Jon– who starred on the show’s sixth season– announced on Sunday that he is now engaged to ‘MAFS’ show psychologist Dr. Jessica Griffin. He posted a photo of himself with Jessica at the Grand Canyon, along with a caption announcing the news. Jon and Jessica began dating after meeting on Jon’s season of the show. Jon and his match, Molly Duff, decided to divorce during their season’s Decision Day, and he began dating Jessica about five months later. 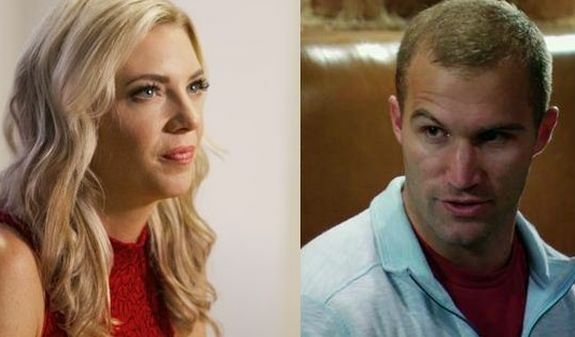 They publicly announced their relationship in August 2018, and were met with some negativity, as some fans felt that, because Jessica also served as the marriage counselor to Jon and Molly, it was a conflict of interest for her to date the now-divorced Jon. Last year, Jessica defended herself in a post to her blog, stating that, in this context she was not the personal psychologist of Jon (or any cast member), and was hired as an expert, so there was no conflict of interest happening. “My role that I am hired to do as a ‘Relationship Expert’ is to provide consultation to the cast of a television show and consultation to production on topics that fall within my expertise,” she wrote. While the couple still received some hate on Jon’s engagement announcement post, the response was much more positive than negative. Several former ‘MAFS’ participants left well-wishes for the newly engaged couple. “Congrats to both of y’all!” commented Season 4’s Lilly Vilchez. Jessica– who has not yet posted to social media about her engagement– is reportedly leaving ‘Married At First Sight’ and will not be part of the upcoming ninth season, according to People. “Jessica and Jon are very happy together. She wants to focus on her family and their relationship,” a friend of the couple reportedly told the magazine earlier this week. Jessica has not yet confirmed that rumor, however. I just loved this guy and have hoped he would end up with a geniue lady that appreciated how good of a guy he is. Molly was a straight up self absorbed b#tch and did not deserve him. Best wishes to this couple. May they forever be happy! CONGRATULATIONS!!!! So happy for both of you. Best Wishes!! !